How do your ecclesiastic leaders encourage young people, such as yourself, to remain members? Why is the committment in the LDS Church so much harder, yet significantly higher than other denominations? I would appreciate any of you Latter-day Saints reading this to comment with a paragraph on why you are active. What keeps you going to Church each week? Why do you have the desire to live the gospel each day? My personal response is as follows. God knows that the challenges we face today are quite different from those that the Israelites and early Christians faced. Any time He has been able to establish His church on the earth, He has called witnesses to testify to the people about what they see and hear from Him. So it is today. We are not left to interpret previous scripture in councils and committees, but instead are given prophets and apostles to give us new scripture for our day, guiding us back to God’s presence. Much like a sitting body of water grows stagnant over time, so does old revelation begin to age. Like a river, revelation must continuously be running and streaming in to wash over us and carry us in its current back to God. I testify that God has called such men in our day to be His special witnesses. We have a prophet on the earth, like unto Moses, Jacob, Isaiah, and the rest. His name is Gordon B. Hinckley. The priesthood of God is the power and authority to act in His name. Such an authority is not to be obtained by going to school, studying the scriptures, or simply going forth and performing acts in God’s name. In fact, we learn repeatedly in the scriptures how unlearned men were called to lead God’s people. In order to obtain the priesthood we must be called of God, as this scripture indicates. Those who have the authority are the only ones who can bestow it, by the laying on of hands, on another. Joseph Smith, the first prophet in Christ’s latter-day Church, received such authority at the hands of angelic ministers. He received the Aaronic (or lower) priesthood from John the Baptist. Later, he received the Melchizedek (or higher) priesthood from Peter, James, and John. Being so called of God, the Prophet was then able to bestow this power upon others, and it has continued in His church until this day. It may seem to some to be a very bold doctrine that we talk of—a power which records or binds on earth and binds in heaven. Nevertheless, in all ages of the world, whenever the Lord has given a dispensation of the priesthood to any man by actual revelation, or any set of men, this power has always been given. Hence, whatsoever those men did in authority, in the name of the Lord, and did it truly and faithfully, and kept a proper and faithful record of the same, it became a law on earth and in heaven, and could not be annulled, according to the decrees of the great Jehovah. This is a faithful saying. Who can hear it? With the power of God, miracles have been performed. Some are too sacred to share. Some easily testify of a God who knows us, cares about us, and wants us to be happy and prosperous. I testify of the power of the priesthood. Holding the Melchizedek priesthood myself, I have acted in the name of God on several occasions. I have been able to bless several people with varying needs. It is a marvelous thing to act in God’s name and strive to live worthily of such a responsibility. I know that we have his priesthood here on earth today. We Latter-day Saints are a covenant-making people. In the ordinances of the gospel there exist several promises we make to God, for which He has promised us blessings in return. Such an active, participatory gospel cultivates personal responsibility and accountability in each of its members. We live up to the promises we make. We are assigned callings in our local congregation to help build up the kingdom. None of the leaders in our church are paid; everybody who serves does so voluntarily. …I will prove you in all things, whether you will abide in my covenant, even unto death, that you may be found worthy. Indeed, to return to God’s presence one must make covenants with Him. Baptism, the sacrament, and other covenants allow us to make promises to our Heavenly Father. One does not renege on a promise to God—hence the desire Latter-day Saints have to be active and live up to such promises. I testify that covenants are a crucial part of the gospel. They facilitate the progression in the gospel that is necessary to gain our eventual exaltation and return to God’s presence. Upon living up to them, we are blessed in abundance. The Holy Ghost serves multiple purposes. It helps us to know the truth of all things. It is also a comforter and a guide. This special gift—reserved for those who enter Christ’s church by covenant—is the method by which we obtain daily divine help in treading the path back to God’s presence. Having this constant companion (if we live worthy of it) allows us to more easily discern between truth and error and know what we should do to fulfill the covenants we have made. I testify that the gift of the Holy Ghost is real and powerful. Having received this gift, I have had occasion to use it repeatedly throughout my life. Through it, I feel God’s hand guiding me in my daily life. I feel His love and interest in my life. I treasure this gift immensely. When the circumstances of the world shift with society’s moral relativism, many people get caught in the rip current. Some of the other churches follow society’s trends and begin to adopt what becomes the “norm” in order to find more acceptance and adherence among their members. Some do it so as not to offend their members. The message of The Church of Jesus Christ of Latter-day Saints remains constant. God personally visited Joseph Smith, and with the aid of angelic visitors restored the gospel to the earth in all its fulness. Along with this restoration came the priesthood, temples, and all ordinances and covenants necessary to provide the opportunity for exaltaton to all of God’s children. These doctrines are comforting. They are palatable. I love knowing that my family and I can live together forever in God’s presence. I love knowing that God has a place to “rest his head”. I love that, since God loves all His children, He has provided a way whereby those who have already died may saved as well. I love knowing that God still speaks to man. I testify that these doctrines are true, and that they are comforting. They attract people all over the world who are hungering and thirsting for them. Further illustrating the reassuring truth that God knows and loves each of us, He has provided patriarchs who, like their predecessors of old, can provide partiarchal blessings to worthy members of the Church. In times of uncertainty, tribulation, or indirection, my patriarchal blessing—a veritable letter from heaven—serves as a guide to remind me of my divine potential and foreordained mission. Reading it frequently helps me to make sure my priorities are aligned with what I should be doing in my life. At the core of all these reasons I have listed is a burning testimony of our Savior Jesus Christ. If all these other things I have previously mentioned were not part of the gospel, I still would participate and remain active because I have a knowledge that He directs this work, that He was resurrected and lives, and that He will come again to rule and reign on this earth. I know that He leads and guides the Church in our day through His chosen servants, and that He suffered for our sins, infirmities, and sicknesses. Why am I active in the gospel? Why do I come each week, and strive to obey God’s commandments every minute of every day? I do it because Christ lives, and through His messengers He has instructed me that it’s what I need to do in order to return to my Father’s presence and inherit eternal glory. And that’s what I’m after. Nothing less will suffice. Well – Connor gave you the long answer. I’ll give you the short one. We do one thing — we encourage everyone, youth and adult alike, to go to Heavenly Father themselves and ask if the things we teach are true and to ask for a confirmation from the Holy Ghost to themselves personally. Why are our youth so active? Because they’re praying and asking and getting the answer that IT’S TRUE. When you receive that answer, YOU KNOW. You KNOW God lives. You KNOW Jesus is THE Christ. You know that the Church of Jesus Christ of Latter-day Saints is HIS Church and HIS gospel restored in this day. When you receive that answer, activity follows. I’d encourage you – – – study this gospel, ask questions, and go ask for yourself. Then you, too, will know. And no sacrifice will be too great. The youth programs of the church do a fairly good job of promoting friendships among the youth. If you want youth to stick around, let them feel that this is where their friends are. This church is very much a church where people get involved. The youth often participate in service projects and the like. They also serve as leaders within the youth organization. People like to feel needed. In the church there are many opportunities for rank and file members – even youth to participate. This church also dos not skimp on teaching meaningful religious doctrine. There is also very stron encouragement to read the scriptures for yourself. And to pray. This encourages individuals to have their own spiritual experiences. I agree with everything that Connor has written above. My personal feelings as to why I’m an active member of the Church of Jesus Christ of Latter Day Saints is simple, I know it’s true. Once you take the time to study the gospel and gain a testimony of its truth, its hard to turn your back on it. It’s like when you go to a really good resturant. You leave thinking that was the best food you’ve ever had…well worth the $20 it cost. Well when you feel that way you want to tell everyone about this great place to eat. It’s the same with the church. Once you have tasted of the sweetness of the spirit and the truth you want to share it with everyone and you want to come back time and time again to be refueled for the coming week. When I miss a week of church I notice a significant difference in my life. I’m not as happy, I’m not as quick to serve others around me, I’m not as kind to my family. I had a friend who was baptized two years ago. She was raised in a good Catholic home, but she noticed that she was missing something. It was a hard road for her to travel, to learn about the Church, to decide to be baptized, to have her family threaten to disown her. They gave her a choice, either this religion or her family. She chose to be Baptized. It was the hardest decision she’s ever made, but it has also made her that happiest that she has ever been. In her case, her determination to become a member of the Church of Jesus Christ of Latter Day Saints showed her family her strength and the importance of this Religion in her life, they chose not to uphold their threats, and instead welcome her with arms open. What other religion is met with such adversity? There are hundreds of stories just like my friends, some don’t end so happily, but still, those that decided to be baptized are happy. If this church wasn’t true we wouldn’t be met with such opposition at every turn. Some people look at us as a church and wonder why we are so “wierd”, but we’re not wierd, we’re special, we’re unique, we’re peculiar to those who don’t understand. If you really want to know what it is that moves the members of the Church of Jesus Christ of Latter Day Saints to action time and time again, get a copy of the Book of Mormon, set up a time to meet with the missionaries, ask them your questions, and have an open heart to receive the words of a Loving Heavenly Father who wants nothing more then for you to return to live with him. If you’re willing to do this, you will understand what it is that keeps us active in our church generation after generation and moves us to willingly give of our time and our possessions to help those around us freely, without payment, or praise of man. Well you’ll have to excuse me for my inability to express myself in writing. But I just coulden’t pass up the chance to share my testimony on why I am the way I am. I can think of two things that keep bringing me to church every week. First, I’d have to go right a long with Connors mother when she said that we ask our Heavenly Father if the LDS church is his church, meaning the only true and living church here in earth. And that is just what I have done. And there is no dening it. I will never forget it. Well it was a summer day and I was reading in the Book of Mormon. I really don’t remeber where I was reading, but I know that I had been praying for several days to know if the church was true and if I was suppost be base my life and dessisions around the teachings of the church. And that morning that I was reading I felt the holy ghost in my heart and body telling and testifying that it was true. I felt it and I knew that what I was reading was true. And that the curch that it belonged to was just as right and true. And as I pondered what I was feeling I knew that it was not something of man. Because nothing in the world had ever made me feel this way. I knew at that time that God loved me so much that he would answer me and guide me in my time of need. It was an awesome experience. And that is what first got me interested in the church and that is where my testimony started. That is how I Know what is true, and every time I start to doubt I need only remember what I felt that day and then I remember why it is that I am who I am and do what I do. Knowing that has helped me base my life on principels that have helped me grow closer to my Heavenly Father and my Savior Jesus Christ. And my second thing that brings me to church is the sacrament that we take every sunday. It is such a great feeling to know that I can be forgiven of my daily and weekly sins when I sencearly repent of my sins and go to church on sunday and take the sacrament. I felt the spirit so strong last sunday as I listened to the sacrament prayers. They talk that if we have truly repented of our sins and forsaken them, we will “Have his spirit to be with” us. And we will be sanctified from our sins and be once more clean as we were after our baptism. I know of no other place on this earth where we can recive such promises, promises that are administered by the priesthood of God. It makes me feel clean. And I know that it brings me closer to my Heavenly Father. I greatest goal in life is to make it back to my Heavenly Father and EVERYTHING in the LDS church supports that and shows me the path to get there. That is why I am who I am and do what I do. I’ll be honest. I don’t know why I am active. Most Sundays I leave wondering if I want to return. But then I do. Friends ask me why I go to church and I don’t have much of an answer for them. If we still taught and practiced Jesus’ Christianity or Joseph Smith’s Mormonism, then I’d have ample responses to give. I guess if anything, I go with the hope that maybe some of it is still there and just waiting to explode. Yesterday, while walking home from church, my wife commented, “I know it’s bad, but I don’t really look forward to church on Sunday.” I responded, “I love the Church, except for the three hours we spend there on Sunday.” So, I don’t know why I’m “active,” i.e., I don’t know why I go to church on Sunday. But the following post from my blog details some of the reasons I remain a Mormon: Why I love the Church. As to why Latter-day Saints remain faithful despite a “harder commitment”, President Hinckley has said that living up to something is motivating and fulfilling. LARRY KING: It’s hard to be a Mormon, isn’t it? PRESIDENT HINCKLEY: No. It’s wonderful. Both of my parents were members of other faiths before joining the LDS church some 26 years ago. I remember both of them, especially my dad, being annoyed by those of other faiths, even his own at the time, who proclaimed one thing and did another. People who could passively attache themselves to a certain sect and think that by mere association they were saved, or better than their peers or whatever else. Those people who chose to affliate themselves with a certain denomination with their lips, but with their hearts and minds were very much removed from their faith. While this kind of behavior can be found in any organization no doubt I believe one of the greatest motivators for him to join the LDS church was because he saw 1) an increased knowledge of doctrine that allowed him to come closer to God and understand His plan for us 2) he saw on a regular basis that membership in the LDS constituted members being actively engaged in the building of the church, serving, and attending to their duties as was not seen as drudgery but rather people lived what they believed. These duties were not reserved for the paid clergy. They were actively engaged in their own salvation, and took an active interest in that of others and showed it by the things they did and how they spent their time. i don’t think we think see life as a Latter-day Saint as harder, as I said above. I feel that because we embrace a more full view of truth we emobdy more fully Christ, and it’s never a burden to do that. Many times we do not recognize that others see something in us. It is a natural, outward result of what we feel inside our hearts. With all due respect to other religions and their programs I see many of my friends who passively participate in their church. Anything worthwhile was never obtained passively. Nor do I believe that any part of God’s program is intended to be passive. For imbedded in each facet of the gospel is us choosing to follow Him in one way or another. I think that the youth of our church welcome the increased standards and other things we are asked to live and recognize that as necessary to increase their faith. No matter how involved a pastor may be with his fold, if the programs don’t have the doctrinal foundation they need they cannot reach the hearts of the people nearly as well as those which are founded upon all the principles of the gospel as Christ taught it. It is my belief that the Church of Jesus Christ of Latter-day Saints offers further insights that other cannot, and thus its general membership is more happy and more faithful. The truth really does make one free. While obviously our leaders encourage participation from all members I believe the active status of a member depends on the level of commitment by local leaders to involve everyone. I love that our church gives callings, or responsibilities to every member who will accept them. By serving along side other members it is we, the congregation who teach, serve and build the congregations in our area and not just a priest or pastor. because we are asked to actively participate I feel that is a main reason why we continue to get stronger because it has a snowball effect. the more we learn, the more we serve, the greater the desire to continue doing those things because they bring us happiness. happiness and joy are gifts of God that He bestows to let us know that we are living as He desires us to, and ultimately we are on the path that will allow us to return to His presence. While it is necessary, and you will find LDS bishops and other leaders encouraging, prodding, and leading the youth you will also see that a person who has “caught the vision” for himself does not need near as much coaxing. I feel that every piece of doctrine we are taught from our youngest years to the newest instruction from our global church leaders is given to us not to accept blindly but to inquire of the Lord for ourselves if it is true. When this occurs, when a person really searches out for himself and comes to a knowledge of a truth, be it a youth or not, he is more motivated to live it because he knows why he is living it. This is from the last General Conference. This statement from Elder Boyd K. Packer can answer Connor’s friend’s question about why the committment in the LDS Church is so much harder, yet significantly higher than other denominations. I don’t know about the rest of you, but I belong to The Church of Jesus Christ of Latter-day Saints (NOT the LDS church). It’s the DOCTRINE. As a convert, I can tell you that for me it is the doctrine that drew me and has kept me. My first reading of the New Testament raised enough questions to fill a sheet of notebook paper. I then took those questions to ministers/pastors of many faiths, but no one could answer them. 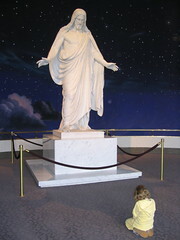 A few months later, a new friend shared the story of Joseph Smith’s vision of Heavenly Father and Jesus Christ. One of my questions was why God intereacted with people in the scriptures, but did not appear to be doing so any longer. Joseph’s firsthand experience set that issue aright. My friend described to me missionaries for the Church: white shirts, black name tags, clean-cut, but up to that point I had never encountered them. Three months later, I did encounter them and easily recognized who they were and also recognized this was more than a coincidence. And the rest is more than history. Take away the social aspects, but as long as the doctrine is revealed by those who have been given the authority to do so (by those with the authority to do so) in an unbroken chain to the Restoration of Christ’s Church in this Last Dispensation of the Fulness of Times, and, having received the Gift of the Holy Ghost, as long as i am worthy to receive direct revelation for life, then I am IN. It is following the lines of least resistance that makes rivers crooked and men weak. I like this statement because it is an eternal truth. Those who do things because they are easy or “fun” never experience truth joy or fulfillment because worthwhile persuits require hard work and choices. My membership in the Church of Jesus Christ of Latter-day Saints is viewed with this lense. Sure it’s hard; and so many Church requirements appear restrictive to most. But the irony is the bonds make us free! Those who experiment upon the word and seek to know for themselves discover the happiness that is the result of living a “Mormon” life. Try the fruit offered by the Church for yourself. Specifically, read the Book of Mormon and test it for yourself. I testify it is true; I know it from my own experience and the results from abiding by its precepts. For me, its the resounding witness that it’s all true. I get a spiritual feeling that this is the right place, and the logic and teachings all fit in so well with everything since the beginning of time. It just makes sense and works so well. Its not always the easiest, but I have no question that in the long run, I’m the happiest in the Church of Jesus Christ of Latter-Day Saints. Hmmm. Good question and many, many good answers posted thus far. I can’t think of much more to add, except that I really liked Connor’s well thought out post and I really liked President Hinkley’s answer to Larry King. That is how being a member makes me feel. I believe in the truth of the doctrine that has been restored through Joseph Smith. I believe we have living Prophets and Apostles that receive revelation today that can be found nowhere else. I believe this because I have had a personal witness of the truth of these things. Yes, the church is made up of mortals with varying degrees of imperfection and weaknesses (like me) but this church is THE church of Jesus Christ, the only church with the keys and ordinances of the gospel. And most importantly for me, this church gives me the answer to why I am here on this earth and what I need to do in my life and what happens to me after death. This doctrine to me is the “big picture” that no other religion comes even close to answering. I want to thank Connor and his friends for these well thought out responses to my question. I have always been impressed with how members of the LDS Church commit to their faith community. The last few years have been difficult for my family as our church is divided by controversy and suffers from declining enrollment. I was impressed by the confidence all of you expressed not only in your current ecclesiastic leaders, but also in your founders. I believe the secret is to have religious education begin first in the home, and that parents should teach by example. We, as parents, need to show our faith to our children in the hope our values and traditions will be passed on. Along with all the aspects that make up the true gospel of Jesus Christ (which Connor mentioned above), if lived, loved, and believed, it truly changes people. I’ve seen that change happen not only in my life, but in others’ lives as well. I think with that “change in human nature” that comes with living the gospel, it naturally follows that people are what we call “active” in The Church of Jesus Christ. “Then Simon Peter answered him, Lord, to whom shall we go? thou hast the awords of eternal life” (John 6:68). I can say this: I know the teachings of the Church to be true because I have specifically prayed to God to ask Him about Himself, Jesus Christ, the Book of Mormon, Joseph Smith, the Church, the temple and many other things, and God gave me a positive answer through the Holy Ghost. I will keep this short and simple. I know that when I am obedient to the commandments we have been given I am happy and at peace. One of the reasons I know the Gospel to be true is the way I feel by living what we have been taught. God loves us. He wants us to grow. But growing requires choices and mistakes. We could not return to our Father after making mistakes unless we were cleansed of our sins. He asked His Son, Jesus Christ, to make a sacrifice for us that we could not make for ourselves, and Christ voluntarily did so. We know of these things because God sent prophets to teach us about this plan and to give us guidance on His will for us. I think of trying to live without that basic knowledge – lost, in doubt, and seeking direction- and living the Gospel lifestyle is easy. Once in awhile, I get fed up with the rules, the structure, and all the talk about “being our best.” I just want to get away and be “me”, or so I think. I go inactive for about–well, I think the longest I lasted was three hours, and then I ALWAYS feel this overwhelming comfort from the Holy Ghost telling me that I am in the right place, and doing the right things, and if I were to stay inactive THEN I wouldn’t be being true to myself. In other words, I wouldn’t be the real “me” anymore. I have found that the teachings of the LDS faith are the closest thing I have found to what I have always believed to be true, before I’d even heard of it. The peace and safety that eminates throughout my life is so strong when I follow the teachings, I can’t help but stay active. I long for that feeling, and I want with all my heart my family to feel those things as well. …if I were to stay inactive THEN I wouldn’t be being true to myself. In other words, I wouldn’t be the real “me” anymore. This shows the importance of understanding all that has been revealed about our pre-mortal life, so that we can realize who we really are, as you said. I am a convert to the Church. But, In actuality we are all converts, be we born into the church or found by the missionaries. I attend church and my children are active because: Then spirit that we feel as we gather together is irreplacable. We have also been commanded to gather together often with other Latter Day Saints. I too find myself asking why did I go to day all I did was fight with my children to behave, Then my wife reminds me that a Prophet has asked us to attend our meetings. Richard has posted a summary about Brother Clayton Christensen his testimony (download here) of why he believes. why I like to go to church. I am active because I am alive (in Christ). PS What is Post #25 doing — advertising? There are still many active youth because they have truly read or understood the true history of the church. “The message of The Church of Jesus Christ of Latter-day Saints remains constant.” How does this relate to OT rules? most of the over 600 rules got dropped in the NT. I understand this was done to make it easier for gentiles to convert, who otherwise would have found it too difficult to follow jewish law. “…. None of the leaders in our church are paid;” How about the general authorities? I heard that these do get paid.